A glorious day at Edwin B Forsythe NWR (known to birders as Brigantine). Arrived 40 minutes before Sunrise, an ideal time. There was enough light for many interesting and colorful captures before the sunrise. Currently there are 1500 snow geese at the preserve. Their flight pattern is very sporadic, but when they take off in mass it's a feast for the camera and their roar and chatter is music to my ears. There was one major flight around 8AM, but instead of flying overhead to the fields, they moved their location in the preserve and I found them later, grazing. I spent at least an hour with an American Bittern. He was a great fisherman, but true to his breed he stayed mostly in the reeds. 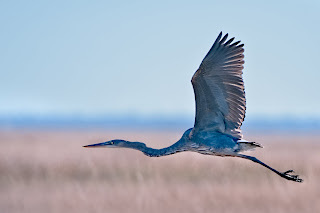 My favorite images from the 12th are the dawn flight and the Great Blue Heron in Flight. I was reasonably close to the heron, used a 200-400VR lens with a 1.4 teleconverter, and was able to pan and get good details in the bird. 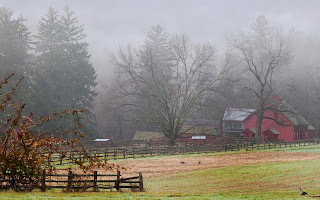 Was greeted with fog Thanksgiving morning and took off immediately for Fosterfields Living Historical Farm. The filtered light added to its charm and I shot a few typical landscapes. What really grabbed me was the enhancement of colors due to the soft light and moisture. 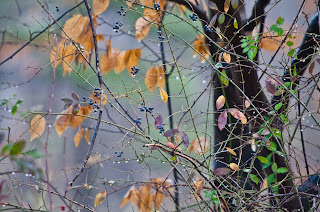 My favorite shot is the close-up of leaves and berries. Adorama in NYC brought together Moose Peterson, famous wildlife photographer, and Nikon (with loaner lenses) for a day shooting at Jamaica Bay NWR. A distant hurricane which brought us damaging winds changed the location to the Brooklyn Bridge and Dumbo (Down Under the Manhattan Bridge Overpass) area of Brooklyn. Thursday night Moose presented an informative slide show at Adorama that was impressive and exciting to watch. We met Friday at 7 AM near City Hall. The guard sent us away from our original location because we were taking too many photos and might be terrorists. Immediately Moose corrected the way I was holding my camera. How right he was, and I am forever grateful for the feedback. The Chambers Street subway station was our next stop and it was ideal. 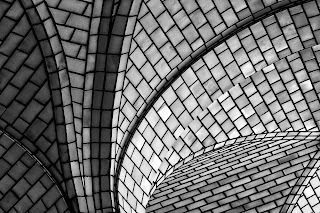 The ceiling tiles and arches with the play on light and shadow consumed our interest for a couple of hours. 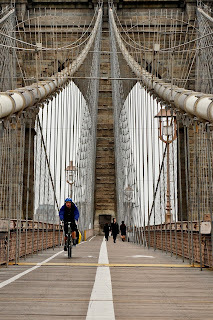 Next we set off on the Brooklyn Bridge. Due to the gray sky, Moose suggested we think in black and white. He said to shoot in color and then consider using Nik Silver Efex Pro to convert to B&W. This was also transforming for me, and has given me a much better understanding of how effective B&W can be. In the middle of the Bridge the wind was particularly strong. I had been wearing a knit hat and felt the need for more protection. Up went the hood on my black coat, and out came the red scarf. Moose noticed the transformation and asked to photograph me. I said yes (and signed away all permissions)because his photo is amazing. Follow the link to his blog, and go down to the bottom of the page to find me. Take at good look along the way at his extraordinary images. He used the soft light to do some incredible close-up work on the wonderful architecture and graffiti. http://moosepeterson.com/blog/?p=10243 Unfortunately Moose lost his hat in the process, since the wind blew it beyond retrieval. The DUMBO section of Brooklyn is old, exciting, historic, and somewhat gentrified. How great to cross the bridge on a cold and windy day and then find Starbucks. 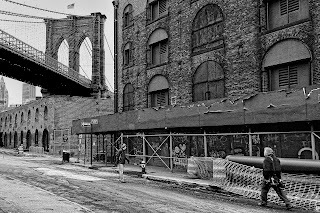 The streets were exciting and the two small parks under the Brooklyn and Manhattan Bridges provided more photo opportunities. I have to go back in better weather and catch a sunset. Lenses borrowed were Nikkor 85 f/2 at Chambers Street, Nikkor 24-70 Brooklyn Bridge, and Nikkor 14-24 DUMBO. All lenses are outstanding. My kudos go to Nikon. Use the above link to go to Moose's blog as indicated, and start exploring his archives and short movie lessons. I check it out every day for information and inspiration. Due to challenging weather, the photo shoot locations changed from the Brooklyn Bridge and Dumbo, to Times Square and Central Park. Since I wanted to shoot the NYC Marathon, this was fine with me. Also the ability to drive in from NJ and park on the city streets simplified everything. I was assigned to the Blue Team, Jim Miotke's group. We had a contest for the day to find and photograph an assortment of things, and we were instructed to travel lightly. This meant no tripod and only one lens. It was great fun and stimulated the photographic juices. It was most interesting to me to see how Jim set up his shots, and how he engaged strangers to make them feel comfortable taking their picture. 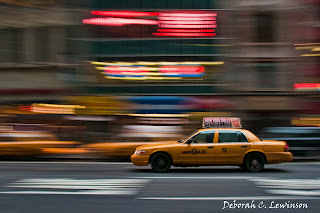 Taxi was my favorite image of the day. It won a Photo of the Day from Better Photo, a few days later. It was created when Jim had us panning the Times Square traffic. 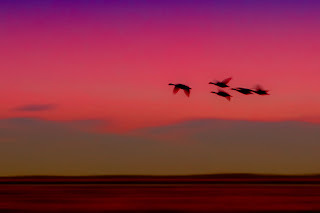 Since I spend a lot of time panning birds, this was relatively easy for me. In addition I learned how important the background is for panning. Fall colors and neon light are ideal. This was my first BetterPhoto Summit, and all presentations were excellent. It was great fun meeting the presenters and BP Photographers whose work I knew and admired. The day concluded with a slide show and critique of the BP Summit Contest entries, and to my surprise, I won first place for this image. 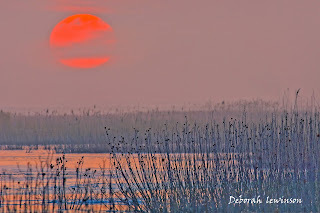 This image was taken at the Edwin B Forsythe NWR. I arrived before sunrise to find it fogged in. This was shot as the fog was lifting, shortly after sunrise.